Moa were superlative birds, and the South Island giant moa was the biggest of them all. Adult females stood up to 2 metres high at the back, and could reach foliage up to 3.6 metres off the ground, making them the tallest bird species known. 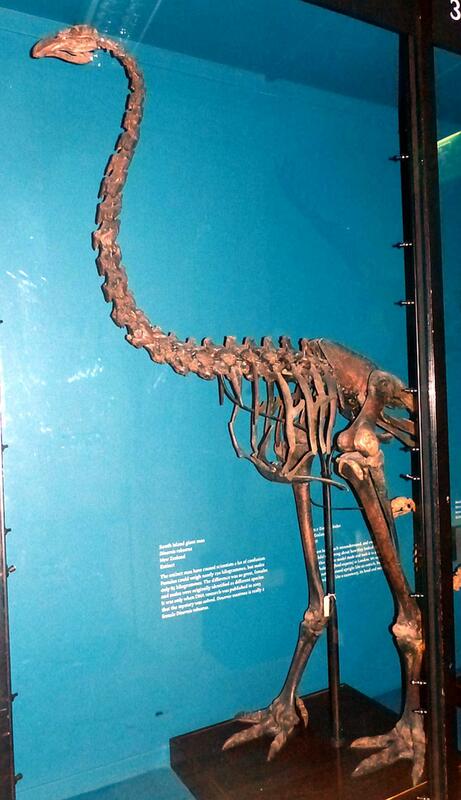 It was one of two species of giant moa, the other being the smaller North Island species, which are placed in a separate family from the two families containing the seven smaller moa species. 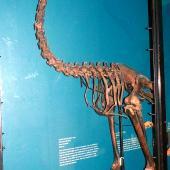 All nine moa were unique among birds in having no trace of wing bones. DNA study suggests all moa species were more closely related to the flighted South American tinamou than to the New Zealand kiwi. They were the dominant New Zealand land vertebrates, exhibiting far greater adaptive radiation than other New Zealand landbirds. Regrettably, all were extinct within a few centuries of human arrival. Moa radiation occurred principally in the South Island, where seven species occurred (five endemic), though it was unusual to have more than four species present at any one site. In contrast, the North Island had only four moa species, including two endemic species. Radiation of moa was coincident with the accelerated uplifting of the Southern Alps and the resulting increase in habitat diversity across New Zealand c.5 - 8.5 million years ago, which may explain the greater moa diversity in the South Island. South Island giant moa ranged widely across all vegetated habitats from coastal dunes to inland shrublands, forests, and subalpine herbfields and grasslands in the South Island and on D'Urville Island. Both the giant moa species (genus Dinornis) had longer, stronger necks than the other moa species, with three extra vertebrae. They exhibited the greatest size difference between the sexes of any bird species, with adult females much larger than males. Birds that inhabited lowland shrubland were larger than those from upland forests. 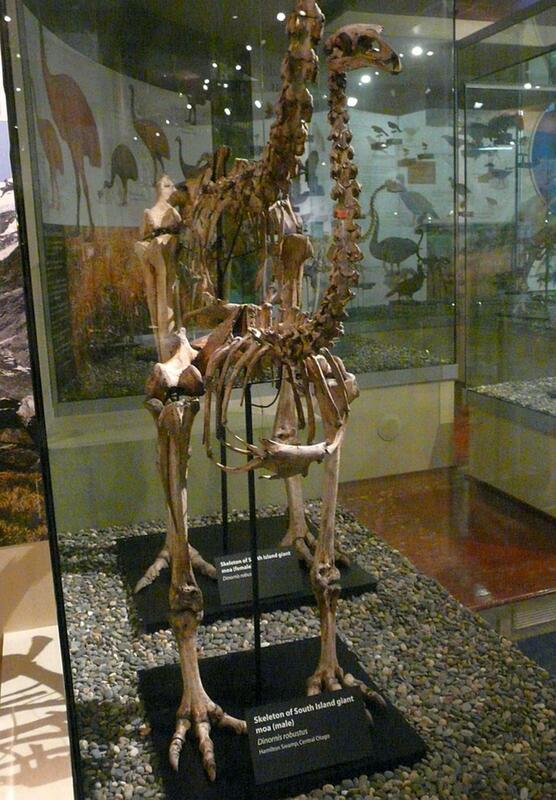 The South Island giant moa was a very tall, relatively slender moa with a relatively small, broad, flattened head, and robust, flattened, slightly decurved bill. 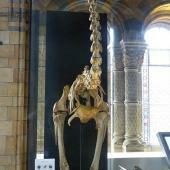 Females were markedly larger than males, being c.150% the height and c.280% the weight. The few feathers attributed to this species indicate that it had a plain or slightly streaky appearance. 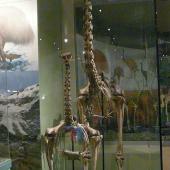 Similar species: the South Island giant moa was much taller and relatively more slender than the other large South Island moa species. South Island giant moa were found in the South Island, Stewart Island and D'Urville Island, in wide range of vegetated habitats including coastal dunes, inland shrublands, forests, and subalpine herbfields and grasslands. 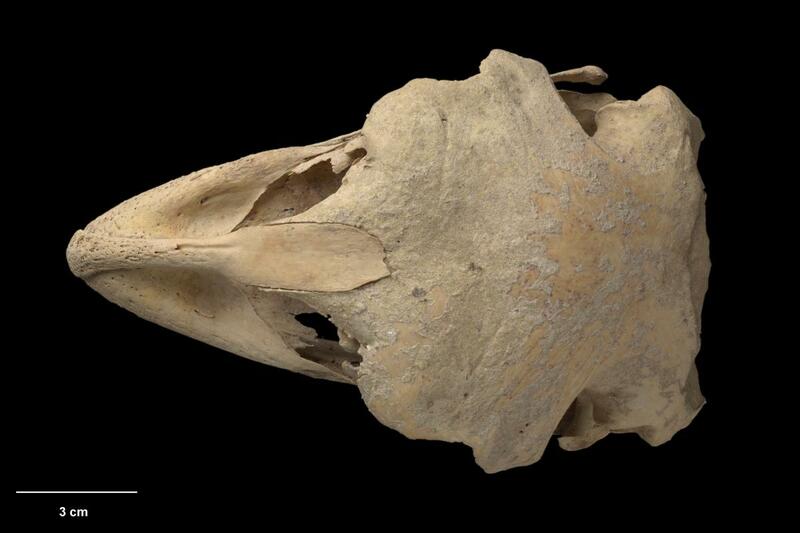 Bones recovered from caves, dunes, swamps and middens show that it was widespread in the eastern South Island from coastal Marlborough south to Southland, and inland to the subalpine zone. 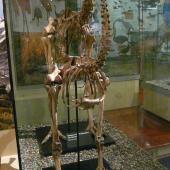 South Island giant moa were widespread and abundant. Before human arrival, the South Island’s main predator was the giant Haast’s eagle, also now extinct. 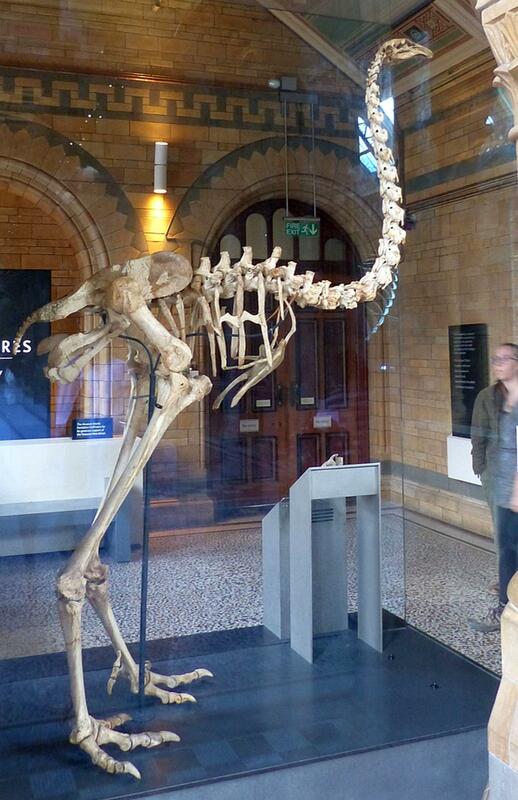 Giant moa were rapidly hunted to extinction by early Maori. 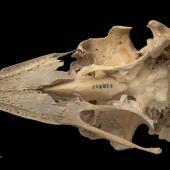 Their bones are widespread in middens, and were also shaped into tools and ornaments. Estimates of the number of individual moa remains in 1,200 open ovens and middens surveyed in the vicinity of the Waitaki River mouth during the 1930s range from 29,000 to 90,000. 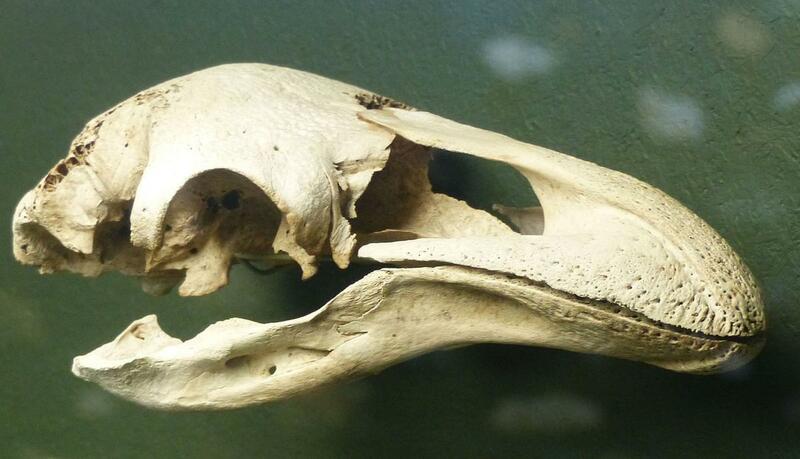 Moa chicks may also have been eaten by the introduced Polynesian dog (kuri). Burning of the giant moa's dry forest and shrubland habitat is also likely to have reduced their numbers. DNA evidence and egg shell and bone remains found at rock shelter sites in north and central Otago suggest South Island giant moa nested in rock shelters in this region. Plant remains found at nest sites strongly suggests they built nests in late spring-early summer. The plant remains found show they clipped twigs 20-60 mm long and up to 4.7 mm wide from a range of locally available trees and shrubs. These twigs were used to build a nest consisting of a shallow bed of clipped twigs, coarse vegetation and stripped bark. Nesting in rock shelters suggests they bred as isolated pairs, rather than in colonies. 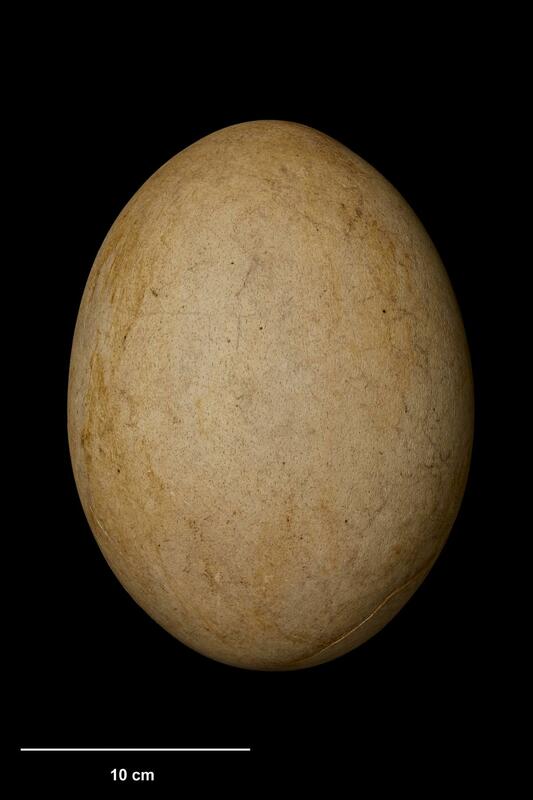 A large white giant moa egg (240 x 178 mm) thought to be of this species was found associated with a Maori burial site in Kaikoura. 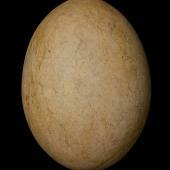 It is estimated the egg would have weighed 4 kg fresh and is the largest moa egg found so far. One or two eggs were probably laid per breeding season. The extremely large eggs suggest an incubation period longer than two months. 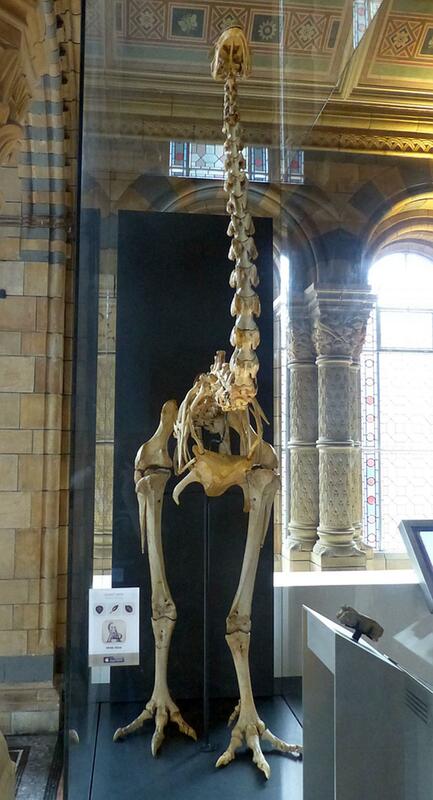 The male is thought to have incubated the eggs, as is the case in most other ratites. Chicks were probably able to forage for their own food soon after hatching. 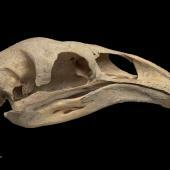 South Island giant moa may have been the tallest birds known, but the largest of the extinct elephantbird species of Madagascar was heavier, possibly up to 340 kg. 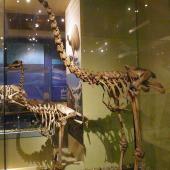 Giant moa were the largest herbivore in prehistoric South Island terrestrial ecosystems. Finds of relatively large gizzard stones and their large robust bill suggest that giant moa were able to process a highly fibrous diet. The relatively large olfactory chamber suggests an acute sense of smell. 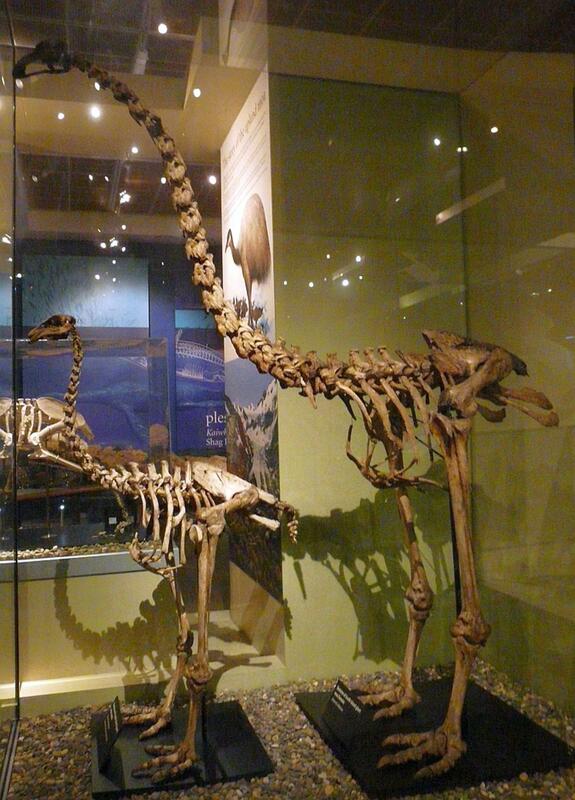 The diet of the South Island giant moa included twigs, leaves, flowers, berries and seeds from the smaller branches of trees and shrubs, and herbs and vines. 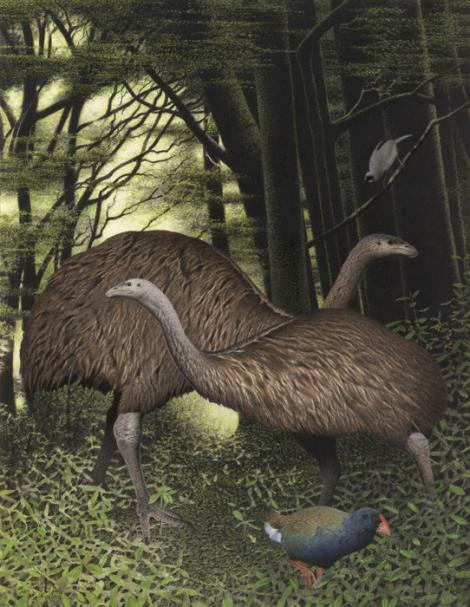 DNA study shows that South Island giant moa in central Otago consumed a wide diversity of herbs and shrubs, reflecting local vegetation patterns and ground-level grazing of herbaceous plants. Anderson, A. 1989. 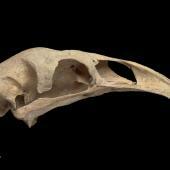 Prodigious birds: moas and moa-hunting in prehistoric New Zealand. Cambridge University Press, Cambridge, UK. Baker, A. J.; Haddrath, O.; McPherson, J. D.; and Cloutier, A. Genomic support for a moa-tinamou clade and adaptive morphological convergence in flightless ratites. Molecular Biology and Evolution, Vol 31, Issue 6, June 2014. Bunce, M.; Worthy, T.H. ; Phillips, M.J.; Holdaway, R.N. ; Willersley, E.; Haile, J.; Shapiro, B.; Scofield, R.P. ; Drummond, A.; Kamp, P.J.J. ; Cooper, A. 2009. The evolutionary history of the extinct ratite moa and New Zealand neogene paleogeography. Proceedings of the National Academy of Sciences USA 106: 20646-20651. Gill, B.J. 2007. Eggshell characteristics of moa eggs (Aves: Dinornithiformes). Journal of the Royal Society of New Zealand 37: 139-150. Gill, B.; Martinson, P. 1991. New Zealand's extinct birds. Random Century, New Zealand. Huynen, L.; Gill, B.J. 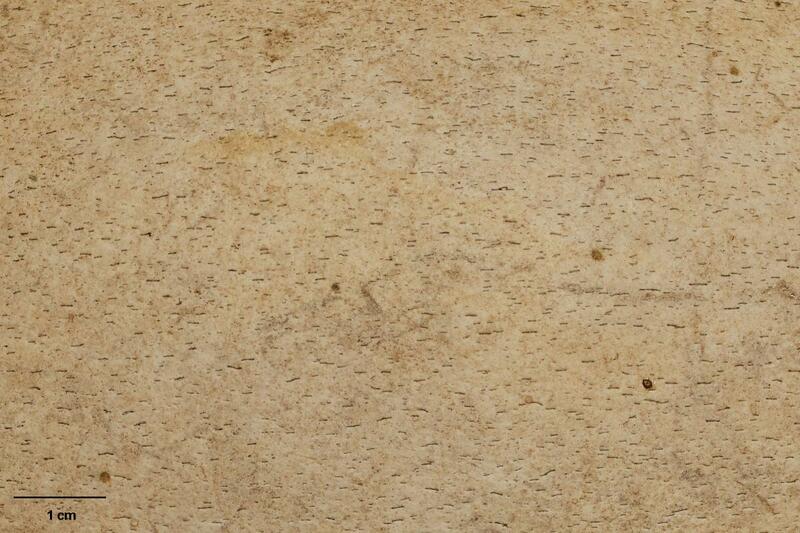 ; Millar, C.D. ; Lambert, D.M. 2010. 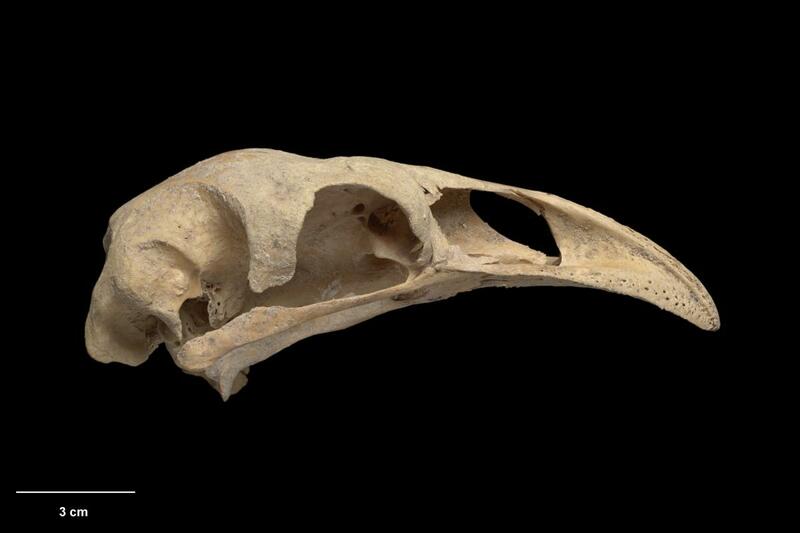 Ancient DNA reveals extreme egg morphology and nesting behavior in New Zealand’s extinct moa. Proceedings of the National Academy of Sciences (PNAS) 107: 16201-16206. Phillips, M.J.; Gibb, G.C. ; Crimp, E.A. ; Penny, D. 2010. Tinamous and moa flock together: mitochondrial genome sequence analysis reveals independent losses of flight among ratites. Systematic Biology 59: 90-107. Rawlence, N.J.; Wood, J.R.; Armstrong, K.N. ; Cooper, A. 2009. DNA content and distribution in ancient feathers and potential to reconstruct the plumage of extinct avian taxa. Proceedings of the Royal Society. B 7 (1672): 3395-3402. Szabo, M. 2005. 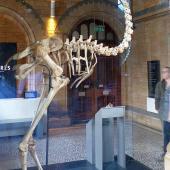 Hobbit-sized raptor became 'Lord of the Wings'. Forest & Bird, May 2005, Issue 316: 12. Szabo, M. 2006. 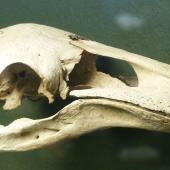 Extinct birds of New Zealand: a preview. Forest & Bird, November 2006, Issue 322: 22-24. Tennyson, A.; Martinson, P. 2006. Extinct birds of New Zealand. Te Papa Press, Wellington. Tennyson, A.J.D. 2010. Dinornithiformes. Pp. 11-18. In: Checklist Committee (OSNZ) Checklist of the birds of New Zealand, Norfolk and Macquarie Islands, and the Ross Dependency, Antarctica (4th ed.). Ornithological Society of New Zealand & Te Papa Press, Wellington. Wood, J.R. 2008. Moa (Aves: Dinornithiformes) nesting material from rockshelters in the semi-arid interior of South Island, New Zealand. Journal of the Royal Society of New Zealand 38: 115-129. 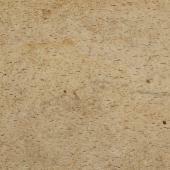 Wood, J.R.; Wilmshurst, J.M. ; Wagstaff, S.J. ; Worthy, T.H. ; Rawlence, N.J. et al. 2012. High-resolution coproecology: using coprolites to reconstruct the habits and habitats of New Zealand’s extinct upland moa (Megalapteryx didinus). PLoS ONE 7: e40025. Worthy, T.H. ; Holdaway, R.N. 2002. 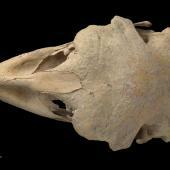 The lost world of the moa: prehistoric life in New Zealand. Canterbury University Press, Christchurch. Worthy, T.H. ; Scofield, R.P. 2012. 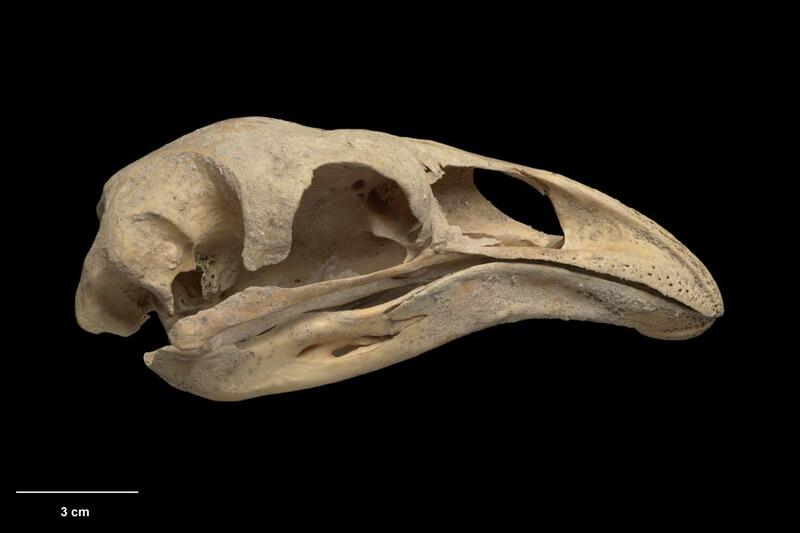 Twenty-first century advances in knowledge of the biology of moa (Aves: Dinornithiformes): a morphological analysis and diagnosis revised. 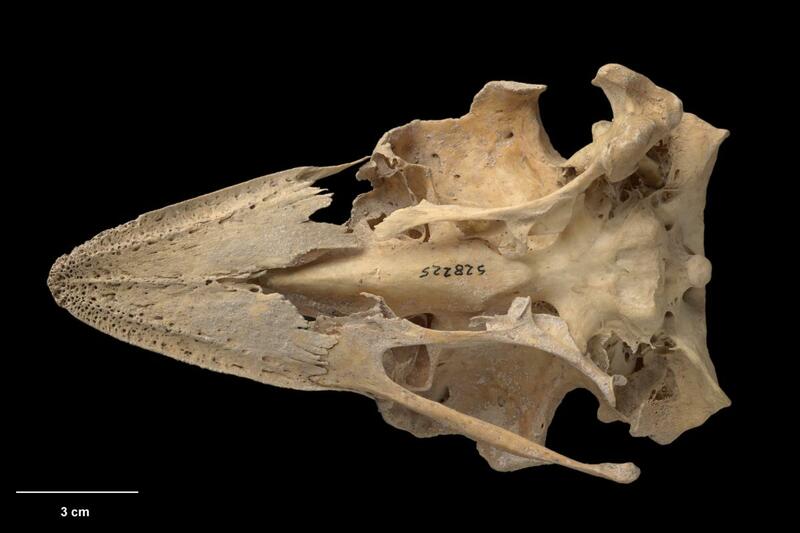 New Zealand Journal of Zoology 39: 87-153. 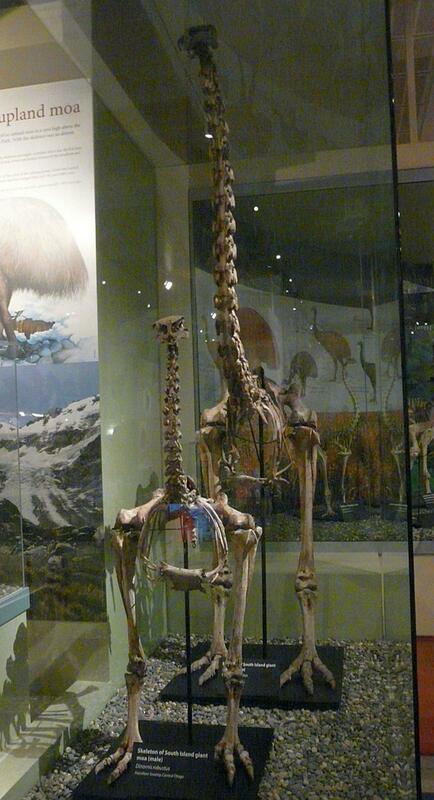 The larger of the two giant moa species with a very tall, relatively slender body and relatively small, broad, head with a robust decurved bill. Females were 1-2 times larger than males.